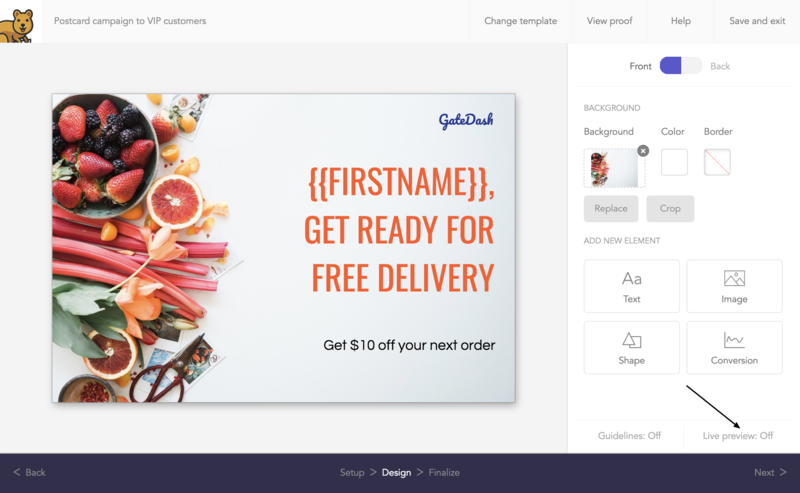 If you're personalizing your mailers, Live preview mode is an incredibly powerful tool to see what each mailer will look like. By turning it on, you'll be able to cycle through all of the recipients in your mailing list. Each recipient will show their merged data in the postcard's design. When in Live preview mode, you'll be unable to edit your design. To turn on Live preview, simply click the Live preview toggle button in the bottom right of the design tool. You can then cycle through the recipients by clicking the < > buttons in the design tool or on your keyboard. Remember to exit Live preview mode to continue editing your design.